Happy Co-Release Day to Fellow 47North author Richard Ellis Preston, Jr.! 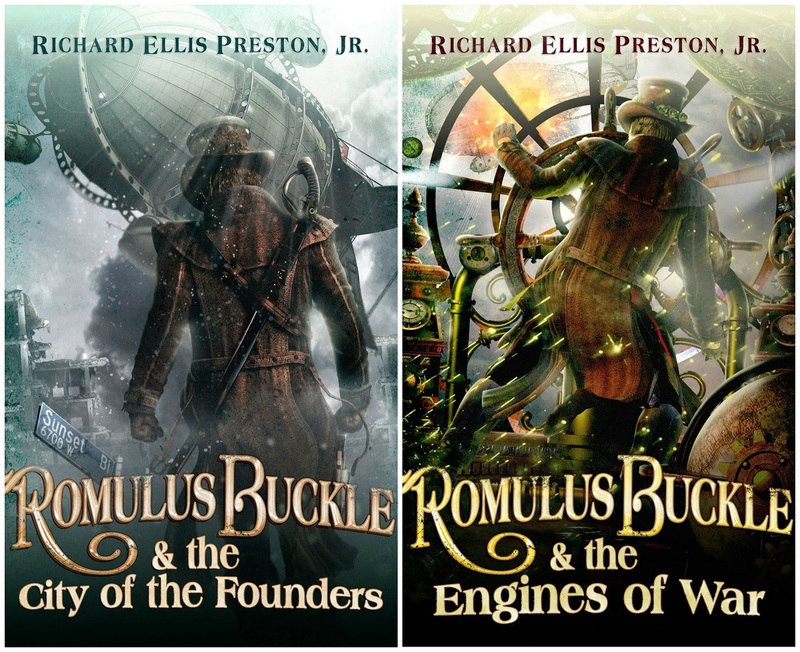 It’s release day for The Curse Keepers, but it’s also release day for another author at 47North: Richard Ellis Preston, Jr. He’s releasing the second book in his The Chronicles of the Pneumatic Zeppelin series– Romulus Buckle & the Engines of War. As the Snow World teeters on the brink of war, Captain Romulus Buckle is desperate to solve the mysteries which haunt him, mysteries which hold the key to his survival and the survival of the Crankshaft clan. Buckle journeys into the treacherous Tehachapi Mountains to discover the true identity of a crashed enemy zeppelin, a wreck brimming with skeletons and secrets. Trapped by a bloodfreezer storm, Buckle is surrounded by hordes of alien sabertooth tigers. And when his beautiful half-Martian lieutenant, Max, comes to his rescue and is horribly injured, both end up fighting for their lives. But this is just the beginning of the battles against the elements and the alien beasties. Arriving at the Crankshaft stronghold at the Devil’s Punchbowl, Buckle joins his father, Balthazar, in a meeting of wary clan ambassadors. Whispering spies have revealed that the powerful but resource-strapped Founders clan is readying for a war of conquest and enslavement and every other clan in the known world is at terrible risk. With assassins and saboteurs lurking in the shadows, Buckle and his crew are forced to team up with former enemies. In a race against time, the crew of the Pneumatic Zeppelin must secure the grand alliance before the Founders invaders can mobilize. More secrets rise to the surface, carried by moonchildren and half-melted robots. And for Romulus Buckle, the search for his lost sister Elizabeth is verging on obsession. Oh my word, I LOVE that cover. More about Richard’s covers below. A few days ago, I had a chance to talk to Richard. Denise: Your bio says you attended a sperm whale autopsy? I’m almost afraid to ask how did you managed that. Richard: I was an ENG news cameraman for CBC Canada in Charlottetown, PEI at the time. The whale had beached and died. A museum wanted the skeleton, so the whale was lifted onto a huge flatbed truck and carted inland to be buried. They were going to dig it up after a number of years and collect the clean bones, I guess. A group of scientists performed an autopsy on the whale to look for disease and other clues as to why it beached itself (along with 5 or 6 others). They basically cut a doorway into the blubber and waded into the spilling guts. The stench was horrific. I had an expensive pair of hiking boots on and when I got home I couldn’t get the fish smell out of them no matter what I did. I left them in the backyard overnight and in the morning I found that the local cats had chewed them to pieces. Denise: I guess that took care of that! Ha! So you lived in Canada for awhile. I love to travel for research, in fact, I’m going to Paris in January. What is the furthest afield you have ever gone to research a book? Richard: Russia, for sure. I went to Russia on a World War Two city and battlefield tour in 2007 to research a trilogy that I am still working on. It was an amazing trip to St. Petersberg, Moscow, Stalingrad (Volgograd, now) and Kursk. I got a lot out of it. When my characters stand in Red Square, I know what it feels like. Such things are not absolutely necessary to writing but they are great to do if you can manage them. Denise: That sounds amazing! (Note to self: Set a book in St. Petersberg.) I know this is going to sound lame and cliche’ but I’m fascinated with the concept of your series. How did you come up with it? Richard: I had always wanted to write a Saturday afternoon matinee kind of adventure novel, something in the vein of The Adventures of Robin Hood and Indiana Jones, with a larger-than-life, swashbuckling hero. I knew I wanted it to be about a crew on a ship of war and I also wanted it to include zebra-striped aliens and strong female characters. The steampunk subgenre provided me with the perfect environment to world-build, to construct the kind of story I wanted to tell. Denise: Did I not tell you all that the concept was awesome??? Okay, totally random question: What is you favorite kind of doughnut? Richard: Plain cake. Yeah. I know. I’m boring as hell. Richard Ellis Preston, Jr. is a science fiction writer who loves the zeitgeist of steampunk. Although he grew up in both the United States and Canada he prefers to think of himself as British. He attended the University of Waterloo in Ontario, Canada, where he earned an Honors B.A. in English with a Minor in Anthropology. He has lived on Prince Edward Island, excavated a 400 year old Huron Indian skeleton and attended a sperm whale autopsy. 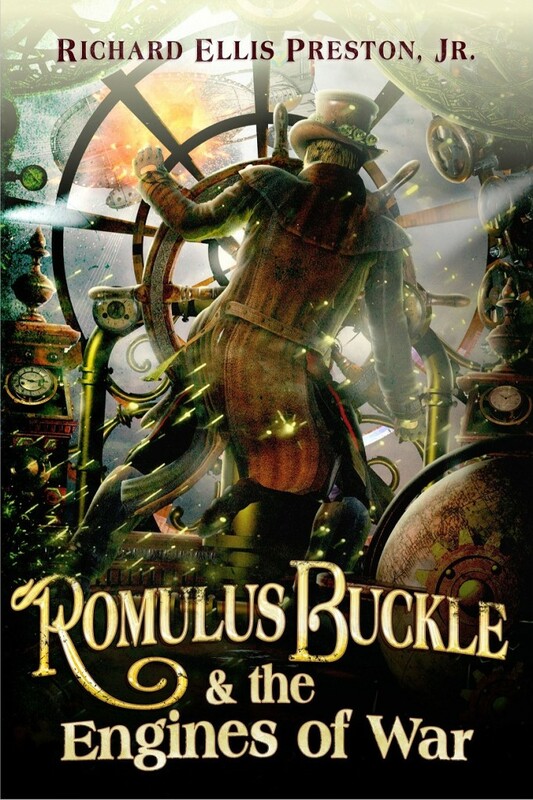 Romulus Buckle and the Engines of War is the second installment in his new steampunk series, The Chronicles of the Pneumatic Zeppelin. 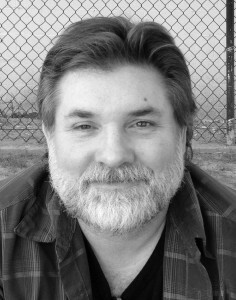 Richard has also written for film and television. He currently resides in California. Now anyone who knows me, knows that I LOVE book covers and Richard’s are AMAZING. I’m definitely planning to check out cover artist Eamon O’Donoghue, who coincidentally designed fellow 47North Author, Steve McHugh. I wanted you to see Richard’s two covers side by side. What did I tell you? Amazing! Be sure to check out the giveaway Richard and are hosting. We’re EACH giving away a $25 Amazon gift card. Enter to win one from Richard here on my website, but hop on over to Richard’s website to win one from me. The city of the founders was a really great book and I can’t wait to read the next one and the Curse Keepers which is on my TBR. Thanks Stephanie for your kind words and good luck with the Giveaway! I just wanted to let you know that I think this series is BRILLIANT! I’m reading Engines of War right now. Okay. That one got booted for a book that is scheduled for review, but whatever. I looooooove it so far!